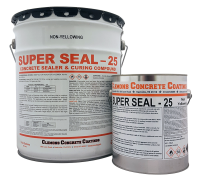 SuperSeal25 can be used for Stamped Concrete, Stamped Cement, Decorative Cement, Bricks, Acid Stained Cement, Concrete Stains, and Exposed Aggregate. 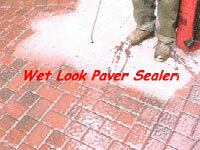 SuperSeal enhances the natural color of your Concrete Brick Pavers and Cement with a "wet" look. SuperSeal25 can be sprayed on with the Chapin 1949 Concrete Sprayer or applied with a 1/2" roller cover. You cannot use a plastic "inexpensive" sprayer. SuperSeal25 will help sand erosion reducing the amount of weeds. Super Seal 25 is not suggested for Clay Pavers. Strip and redo so the SS25 can properly soak in and darken the color. Is this good to use on unilock pavers? We had it sealed last year but alot of the unilock pavers turned white so the contractor has to redo it this spring/summer. I'm looking for a wet look. The contractor will need to strip off the current sealer that has turned white first before resealing. The SS25 will work correctly as long as the current failed sealer is removed. can this be used on outside travertine pavers? Wet look and or gloss sealers like the Super Seal 25 will not work very well for a broom finish. Dries uneven. You would want the Super Seal-M.
Csn you use this product on field/flagstone walkways? It is not designed for flagstone. What happens if you use it on stone? I tried a test area and it looks great. It could dry blotchy/uneven when applied to a larger area. We had a stamped patio installed a couple of years ago and is showing wear and some of the original sealant chipped off within a year of it's application by the contractor (it was put on REALLY THICK), are we able to put this product directly on top of the existing sealant or do we need to strip the previous stuff? No, you should not thin or cut the Super Seal 25. The Super Grip easily mixes into the sealer. One Super Grip per 5-gallon pail. Apply in temps of 50-90 degrees. My contractor recently applied this sealer to a concrete-like (Miracote MPC) surface that had likely heated up beyond the 90 degrees in some cases. Some areas now have an alligator skin appearance -- which is fine as long as the sealer won't fail as a result. And some areas have developed micro cracks in the sealer (probably along micro cracks in the MPC coating) that are whitish in color and appeal to be a break in the sealer. My plan is to leave the alligator skin areas alone and to use a small paintbrush to apply additional sealer over the micro cracks. Try Xylene solvent on a spot to see if that removes the white. Hi, I've recently sanded and sealed my pavers and the seal looks fantastic! However, in a couple of areas under where we've sealed there are white patches that look like dust. They've faded slightly, but in the month since we've sealed the driveway they still haven't gone away. Is this just water that was trapped under the seal? (There were some dirt spots I pressure washed away before sealing) or is this something else? Do I need to put more seal down to get rid of them? What are your suggestions? Thanks! You can spray with the Chapin 1949. It is fairly easy. Just make sure that you pump well to start and that you continue to pump while spraying. This will be my 3rd time sealing my six year old exposed aggregate driveway, walkways and steps with SuperSeal 25. The past 2 times I used an 18" roller and 4" paint brush. This process took 2 days to complete. My question...would the application be "less" backbreaking and quicker using a sprayer? It is typically not slippery after full cure of about 2 weeks. It does dry within a couple of hours of application though. This product is a breakable sealer, hence why it is not 100% filming to create a slippery surface. Hello, my property is in South East Florida and we want to clean and seal our brick paver walkway into the clubhouse. I would like it to brighten up the pavers and seal in the sand, but it is a 55+ community and I am concerned with it being slippery. Do I need to be concerned or can you recommend this sealer for a highly used walkway? Lastly, how long after applied can it be walked on? 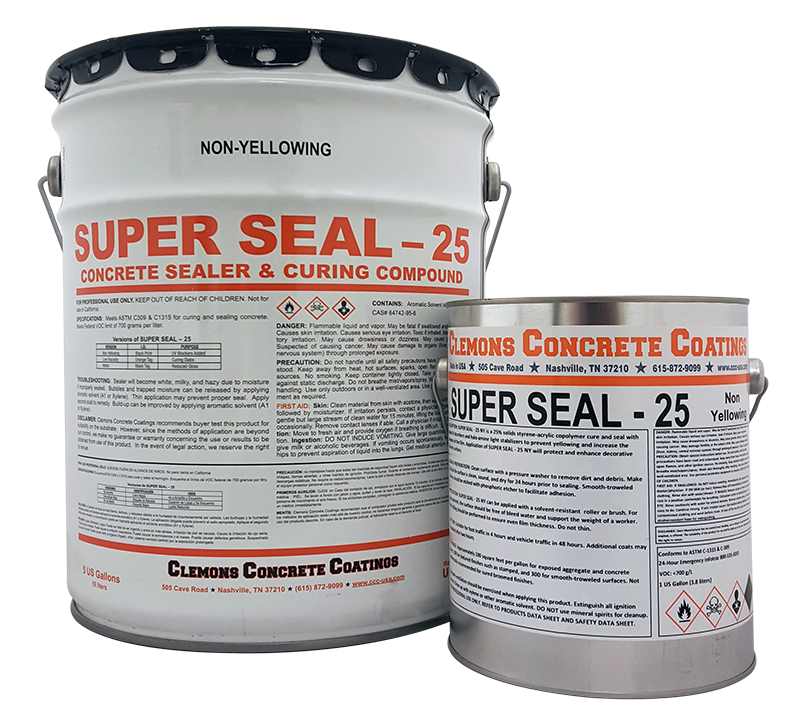 Do you sell Super Seal-25 VT concrete sealer in 1 gal containers? I am in Florida and I have a 2K foot paver driveway. I desire the wet look but concerned of creating a slippery surface others have experienced using Gloss and Semi gloss products around pools. I am considering the Matte but I have been told those familiar with your product, the SS25 is very close to the Matte and there has been no problems with slick surfaces on driveways using the SS25 and that is the most widely used product. Since I need (4) 5 gallon pails it saves me a little electing the 25 over the Matte. Do you believe the SS25 will best suit my needs or is there any concern with a driveway that have your recommend Matte. You can add the SuperGrip in the final coat. Should not change the appearance. Make it is evenly mixed into the sealer. We just finished applying 2 coats of SuperSeal 25 and it looks like we're going to need to apply one more coat to some of the tiles (some were much more porous than others). I like the shiny look on the tiles but they are a bit slippery when wet. If we added the Super Grip, would that change the appearance of the tiles? Is it OK to apply the SuperSeal with added Super Grip over tiles that have just been sealed? Thanks! Without knowing what the other brand was made of, it is impossible to say. Not all sealers are compatible with each other. In general it would work with most. 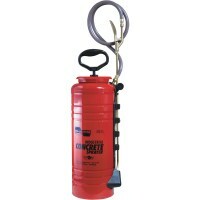 We sell a Super Grip that can be added. I live in Utah and have a stamped concrete pool deck that has not been sealed for 2-3 years. It is faded and needs resealing. I don't know what type of sealant was used the last time the deck was sealed. Can this sealant be used over whatever sealant is currently left on my deck? Should I add shark grip to reduce slipping? The SS25 is for decorative concrete such as pavers, stamped concrete, etc. Do you have this type or plain poured concrete? I have a 100 year old Oak Tree in my back yard. I also have a lot of concrete. The Oak tree is constantly dropping something on my concrete. Will SuperSeal 25 seal out any stains caused by the droppings of my tree. Also dogs paw prints from dirt that they may carry onto it as well? My concrete seems to be easily stained. I have to use a pressure washer constantly as a wash down of a hose does not get the job done. Bernie, not you should not apply this over a newly sealed surface. It could "repel" the SuperSeal. I live in Naples Florida and had my driveway coated with a water base sealer. Can I use the SuperSeal 30 or 25, after powerwashing.? You should not reduce the SS25 with xylene. Use as is.